This is the weekend that reminds us fall will be approaching. Very shortly, Football, Cross Country, and Soccer will get our attention. The mornings will also be chillier. However, this weekend we have an opportunity to enjoy a few days and use our grills at dinnertime. For my family it started last night with Grilled Swordfish. Tonight, we enjoyed Grilled Haddock along with Tangy Tortellini Salad and a fruit salad. Luscious London Broil will be enjoyed another evening over the weekend. Enjoy the remaining relaxing days of summer. This morning the fragrant inviting aroma of peaches filled our kitchen. Two separate batches of Peach Freezer Jam were made. Tomorrow (after the 24-hour time period that Freezer Jam requires), the containers will be placed and stored in our freezer. Now, our supply of Strawberry, Blueberry and Peach Freezer Jam has been prepared. We will be enjoying these colorful delicious jams all year. After making the jam there were six juicy peaches left. Now, that was an invitation to bake a scrumptious dessert. The mouth-watering peaches would make an appetizing Peachie Crisp. 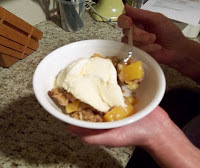 The ingredients and method for Peachie Crisp are similar to Apple Crisp, except that peaches are used rather than apples. ***I also remove the skins from the peaches using the following method: Place each peach in simmering water for about 35 seconds. Remove from the hot water and cool. The skins will peel off with no waste. 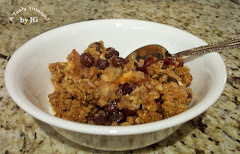 Then, I followed my Apple Crisp recipe and used about ¼ Cup of Craisins. (The 1-cup Ziploc container in my fridge containing the dried Craisins soaking in apple juice comes in handy.) I also used a little less brown sugar. After the dessert was baked and cooled, it was placed in our fridge. Cold Peachie Crisp with a scoop of vanilla ice cream! That is a GREAT dessert! Bake it and try it. You will like it! Articles that we read remind us that bananas are a good source of potassium. I do try to eat one every day, but it is not one of my favorite fruits. For me to enjoy eating one it cannot be green or overripe. In the warm weather they ripen too quickly! However, a nice treat to devour occasionally is a moisty, fragrant, delicious Banana Crumb Muffin (click on bolded words for recipe). It is a great way to use two overly ripened bananas. Any extra muffins can be stored in the freezer. The amount of Brown Sugar in the Topping can be reduced according to taste. You and your family will enjoy these! In the warmer weather when the locally grown zucchini, green peppers and summer squash are available, I make Sauteed Combo (click on bolded words) quite often. It is definitely a treat to use the local produce. Sometimes, we have a small portion left after dinner, so the remaining amount is covered and placed in our fridge. This small portion combined with previously prepared Bow Tie Pasta is the beginning of another yummy side dish. Have you ever prepared a bit too much pasta? I usually do, just a bit. A few evenings ago Bow Tie Pasta was part of our dinner, and the extra pasta was also refrigerated. Those two enjoyable foods became the basis of Bow Tie Veggie Medley. The pasta was reheated in a skillet with 1 TBS. Olive Oil. The extra Sauteed Combo was added along with 6 halved cherry tomatoes. A little Basil was sprinkled on top. What a delicious side dish! To think that it all started with leftovers from two dinners that we enjoyed three days ago. Sometimes after everyone has eaten dinner, a small portion of the delicious meal remains in the serving dish. That circumstance occurred two nights ago after we had enjoyed Pork Tenderloin and Veggies (click on link) for dinner. Last night a small portion of the Sauteed Combo (click on link) was left. Both of these foods had been placed in our fridge, so today, I knew that they would be used, but not sure how. The word – leftovers – just does not sound appetizing. And, it does not fit the description of the scrumptious, tasty, colorful meal that we enjoyed tonight! Ah, the Pork Tenderloin and Veggies were combined with the Sauteed Combo, 3 Tablespoons of Cold Water and reheated in microwave. They were served over a bed of prepared Bow Tie Pasta. A small sprinkling of Parmesan Cheese added more flavor and color! Easy, delicious and colorful! It is always worthwhile to cover and refrigerate any portions of dinner that is not enjoyed at a meal! Those portions can make another great meal. They certainly did tonight. We enjoyed it! Yummy! After enjoying a delicious Clam Roll at Wellfleet Harbor and a tender Lobster Roll in Orleans, it was time for me to return to my kitchen and remember where my pots and pans are located. Watching a Cape Cod Baseball League Game is now a great memory. Visiting the Cape (in MA) was fun and relaxing! This afternoon my West Bend Slow Cooker was taken down from the shelf. All of the needed ingredients were placed in the non-stick container. While I was working on other tasks, Pork Tenderloin and Veggies was very slowly cooking itself. The preparation was easy and the meal was delicious! 1. A one-pound bag of peeled Carrots were rinsed and placed on the bottom of the Slow Cooker’s pot. 2. One Potato was washed and cut into chunks and placed on top. 3. Two Bay Leaves were added along with two shakes of Oregano, Basil and Garlic Powder. 4. A one and one-fourth pound piece of Pork Tenderloin was rinsed and then cut into one-inch chunks and placed on top of the vegetables. 5. Two shakes of Black Pepper and Parsley were sprinkled on top. 6. Two Tablespoons of Flour were blended with one 14-½ ounce Can of College Inn Light & Fat Free Chicken Broth and one teaspoon Worcestershire Sauce. This mixture was poured on top of all of the ingredients. 7. The Slow Cooker’s lid was placed on top. 8. The temperature setting was set. #5 High for 2 Hours. Then, after two hours, the temperature was turned down to #3 Medium for One Hour. Our dinner was ready and my husband asked, “Is that Pork Tenderloin?” Yes, it certainly was. Pork Tenderloin and Veggies required very little preparation, smelled inviting and tasted YUMMY!